By Dale Johnson Posted: May 15, 2017 12:15 p.m. 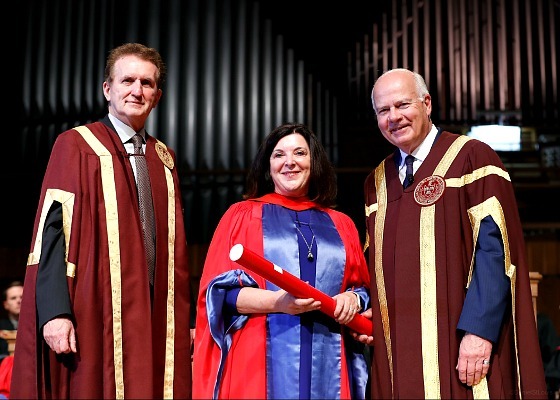 The President and Vice-Chancellor of the University of Regina, Dr. Vianne Timmons, is an honorary degree recipient from Mount Allison University. “I was shocked as I did not know I was being considered. Then I was honoured and humbled,” Timmons says. “They have so many people to choose to honour. I am so overwhelmed they selected me,” she adds. Honorary degree recipients are individuals who are nationally or internationally recognized within their fields or those who have demonstrated services to the community, significantly affecting the University and/or the region. Timmons was recognized for her work in three areas: advocacy and empowerment of women leaders; internationalization; and disabilities and inclusion. “This feels like an honour that acknowledges my life choices and career,” she says. Receiving this award is extra special, because Mount Allison was the first university she attended, where she earned a degree in English and Psychology in 1979. After accepting the honorary degree from Mount Allison’s Chancellor, broadcaster Peter Mansbridge, Timmons reminisced with the students about her formative years at Mount Allison, which included playing on the field hockey team and working in the canteen, a job that sometimes meant scraping gum off the bottoms of tables. She also talked about the adventure of moving away from home and meeting inspiring professors – balanced by the stress of studies and isolation of being away from home. She also told the students to look back on all they have achieved at university – and also to look forward to their futures. Mount Allison was founded in 1839 as an academy of elementary and higher learning. A Ladies’ College opened in 1854 and the institution granted its first two Bachelor degrees in 1863. It was the first University in the British Empire to award a Bachelor degree to a woman – Grace Annie Lockhart in 1875; the first Canadian university to offer a Bachelor of Fine Arts degree; the first to offer a Canadian studies program; and is home to the oldest university art gallery in the country. Mount Allison University offers degrees in Arts, Science, Commerce, Fine Arts, and Music. The University has approximately 2,300 students.